1. the state or fact of being present, as with others or in a place. In the Garden of Eden man walked in the very presence of God. After the Fall man walked differently with God; separated from Him because of sin. After Pentecost man walked differently with God yet again. No longer God with us, but God within us. His Presence tabernacle-ing within man. The Hebrew word for presence is paniym, which means face, surface, presence. I have been very familiar with this Hebrew word for many years and smugly thought I knew all about it … until I researched it for this study. I stopped in wonder when I discovered paniym also means, “before and behind, toward, in front of, forward, formerly, from beforetime, before, to the front of …” Amazing. Why can we be at rest? Why can we be at peace? Because He is with us, guiding us, protecting us, leading us, holding us in the palm of his hands. God’s presence is all over us and all in us. His Presence brings us rest. This holiday season, when we are feeling rushed and stressed, we don’t need to seek peace; we need to seek Presence. Thank you for joining us during this season of Thanks Giving. May your day be blessed! Please leave a comment below in the Comment section on what God teaches you today about Presence. presence. Dictionary.com. Collins English Dictionary – Complete & Unabridged 10th Edition. HarperCollins Publishers. http://dictionary.reference.com/browse/sacrifice (accessed: November 15, 2014). “Exodus 33 (New King James Version).” Blue Letter Bible. Sowing Circle. Web. 22 Nov, 2014. <http://www.blueletterbible.org/Bible.cfm?b=Psa&c=111&p=0&rl=0&t=NKJV>. 1. not hesitating or fearful in the face of actual or possible danger or rebuff; courageous and daring: a bold hero. 3. necessitating courage and daring; challenging: a bold adventure. I am often confused as to why people associate Christianity with weakness and timidity. The International Society for Human Rights estimates 7,000 to 8,000 Christians are martyred each year. It takes great boldness to swim against the tidesof culture and be what God has created us to be — born-again believers. Thankfully, God did not save us then leave us to fend for ourselves in a world that is not our home. He did not give us a spirit of fear, but of power, sound mind, and love. Because of the gift of His power, we may live with great boldness, despising persecution and oppression. Read our focus verse for today again. What is the result of suffering? Boldness. 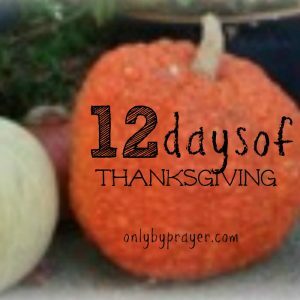 This Thanksgiving, let’s give thanks to God for His gift of boldness. Boldness with Our Gifts: Dearest Father, we thank You for the blessing of boldness. Gifts are meant to be used; not relegated to a shelf to collect dust. Help us to claim Your gift as our own, and boldly use it to make disciples, edify other believers, and bring You great glory. Give us discernment to know when You’re calling us to boldly leap by faith and witness for the Gospel. We pray in Jesus’ Holy Name, Amen. Boldness with our Words: Dear Lord, thank You for entrusting us with the Gospel. Help us to faithfully fulfill this amazing privilege. We do not have to worry about what to say because You have given us the words in Your Word. We may boldly proclaim the truth, sowing seeds of salvation in every relationship, situation, and experience we encounter. Help us to boldly speak and trust You for the outcome. Thank You we don’t have to feel bold to be bold. Amen. Please leave a comment below in the Comment section on what God teaches you today about boldness. Bold. Dictionary.com. Collins English Dictionary – Complete & Unabridged 10th Edition. HarperCollins Publishers. http://dictionary.reference.com/browse/sacrifice (accessed: November 15, 2014). “1 Thessalonians 2 (New King James Version).” Blue Letter Bible. Sowing Circle. Web. 22 Nov, 2014. <http://www.blueletterbible.org/Bible.cfm?b=Psa&c=111&p=0&rl=0&t=NKJV>. 1. the teachings of Jesus and the apostles; the Christian revelation. 3. (usually initial capital letter) any of these four books. 6. glad tidings, especially concerning salvation and the kingdom of God as announced to the world by Christ. Many people believe the truth of the Gospel pertains to a moment of decision; when Jesus is accepted as Savior. While the life- giving words of the Gospel are the key to salvation, they also unlock the plan for daily life. As Christians we have the privilege of speaking the Gospel into our everyday trials and tribulations and our greatest challenges and hardships. Let the truth of the Gospel transform your life from day one until Jesus calls you home. I am so thankful that the Gospel is our hope for eternity and for the everyday. What are some ways you can let the Gospel transform your daily life? Perhaps we can try one of the following suggestions this week. To offer tangible help to the brokenhearted. We can be the hands and feet of Jesus by taking a meal to a grief-stricken person, offering time to listen, sending a card, or calling. Pray for those caught in sin or addictions. While we cannot force people to give up drugs or alcohol, we can fervently pray that they will be convicted of their sin and see their need to be set free. Volunteer our time. Many churches and ministries need help with their programs. Consider serving in a food pantry, volunteering at a pro-life clinic, teaching a Sunday school class, or working at a homeless shelter. Please leave a comment below in the Comment section on what God teaches you today about gospel. gospel. Dictionary.com. Dictionary.com Unabridged. Random House, Inc. http://dictionary.reference.com/browse/gospel (accessed: November 24, 2014). We spend much of our lives trying to get approved. Jobs have rigorous interviews. Colleges – and even some preschools — have intense application processes. Even getting a credit card requires a certain level of financial stability. It’s in the midst of our performance-based culture that God offers us a free gift: becoming his disciple. Surprisingly, Jesus doesn’t have a list of prerequisites we have to fulfill before becoming his disciple. He walked up to Matthew’s tax collector booth – maybe even while Matthew was in the middle of overcharging the poor and pocketing the surplus – and called him to be a disciple. Action Step: As we near Thanks Giving, thank God for the gift of becoming his disciple. Express to God how much learning at his feet means to you. As disciples, our mission is to follow God. We’re also called to disciple others. Take a look at Matthew 28:19-20 again. These were the last words Jesus spoke before leaving the earth. We should treat them like we would the dying wish of a loved one – with great weight and importance. Action Step: Ask God who in your life he is calling you to disciple. Then, reach out to them and help them learn what it means to live as an authentic Christ follower. Our guest poster, Amber Miller, is a board game fanatic, coffee enthusiast, and proponent of loud laughing. She lives in St. Louis with her husband, trying to further God’s kingdom one small step at a time. Visit her blog at liveandlaughloud.com. 4. the subject in hand; the point at issue. 5. practical result, effect, or advantage: to act to good purpose. One of the Greek words for purpose is prothesis. At its root, prothesis means to set forth to be looked at, to place in public view. According to this definition, part of our purpose in Christ is to make manifest the power of God in our life. We are to shine forth how He has redeemed, restored and shaped us into the image of Christ. We place ourselves in public view when we purposefully use our gifts to speak God’s truth to the lost of the world. How are you using your gifts to show the world there is purpose to your life? Purpose of Life: Dear Father, we give thanks for You have called us to live a life of purpose. Thank you we have a reason to get up each day and we have important work to do for Your kingdom. We also give thanks because You use all things for Your purposes … good things, bad things, hard things, painful things. You even re-purpose our failings and mistakes to work for our good and Your glory. Father, You have specifically gifted us to be fruitful and effective ministers of your Word. We are Your hands and feet. Please send us and use us according to Your purpose. We thank you for the gift of purpose. Please leave a comment below in the Comment section on what God teaches you today about purpose. “Exodus 9 (New King James Version).” Blue Letter Bible. Sowing Circle. Web. 22 Nov, 2014. <http://www.blueletterbible.org/Bible.cfm?b=Psa&c=111&p=0&rl=0&t=NKJV>.